MyCharge has been around for a while, with products ranging from standard battery packs to those designed for, well, a rougher lifestyle. 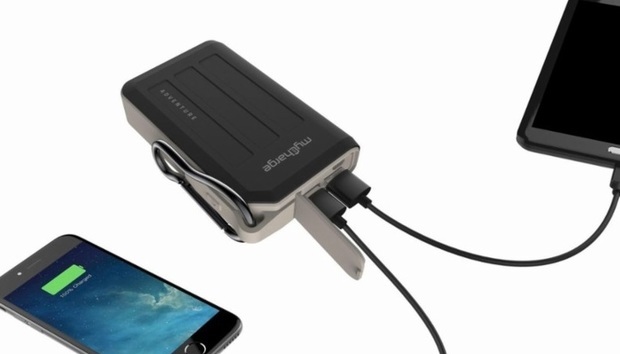 The MyCharge Adventure Max is a 10,500mAh (37.2Wh) battery pack with a rubber exterior. It’s splash, drop, and dirt resistant. A carabiner hook helps attach it to a belt loop or exterior of a backpack. None of the ports are exposed to the elements, with an attached flap you have to move to the side to reveal two USB-A and a single Micro-USB port for charging the pack itself. A power button is found just below the carabiner, along with a few indicator lights. Included in the box is the MyCharge Adventure Max and a Micro-USB cable. There is no case, because, well, that wouldn’t make sense for a battery pack that’s supposed to withstand the occasional abuse. The biggest drawback to this particular battery pack is its efficiency. It came in at 78.31 percent. As with other packs that approached the 80 percent mark, it’s not a deal breaker but you’re not getting the most use compared to other packs we’ve tested. In total, it took 6 hours to charge the pack from empty. Again, not the best result, but not horrible either. The Adventure Max is designed for a specific use case, and in that light it does what it’s supposed to do. I test dropped it a few times and the exterior held up, and the pack kept working. Bottom line: If you’re hard on accessories and devices, the MyCharge Adventure line is for you. This thing can take a beating. CIO Spotlight: Mark Hopkins, Skullcandy, Inc.